Like any code of honor, the ideals of chivalry have to be put into practice in order to be of value – and for knights of the middle ages, one very visible way of putting their chivalric principles into action was through a sort of an exhibition match known as a “passage of arms”, a test of both skill and (perhaps even more importantly) personal fortitude, courage, and respect in the face of an armed adversary. While not intended – specifically – to be as hazardous as a life-and-death duel or melee, a knight who took part in a passage of arms was showing that he had the skills – and the strength of character – to engage in something that was “as close to the real thing” as possible. Today there are very few opportunities for those interested in reviving the ideals of chivalry to take the field in a true passage of arms – but in the coming month, as part of the historical sword combat conference and workshop known as Longpoint, a small number of individuals who’ve put in a lot of study and practice into the art of medieval armored combat, will take the field in a modern invitational passage of arms intended to be “a showcase for members of the HEMA community to show the public-at-large the precision and technicality of fighting in armor.” Longpoint is coordinated by the NY Historical Fencing Association, and will be held July 23-26 at the Turf Valley Resort in Ellicott City, Maryland; and the invitational passage of arms – which is just one of many activities at the event – will be coordinated and presided over by author and HEMA instructor Jessica Finley. Jessica Finley has been studying medieval sword work and martial arts for more than a dozen years with the Selohaar Fechtschule. Her book “Medieval Wrestling: Modern Practice of a 15th Century Art” was published in 2014 by Freelance Academy Press as part of their “Medieval Martial Arts” series, and her paper on medieval wrestling can also be found in the collection “In The Service of Mars,” a selection of pieces on historical martial arts from the same publisher. 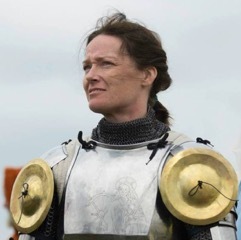 Jessica placed second in the “women’s longsword” tournament held at the Longpoint 2012 conference.